Numerous studies have shown that the socialization skills of children are developed through shared experiences within active imaginative play. Parents want to provide their children with just such an environment, rich in creativity and play. For this reason, products such as kitchens, playhouses and cars, which simulate the activities of parents' lives, are so popular. Modern urban construction tends toward the small and crowded, preventing parents from giving their children full child-size activity experiences; the necessary space is simply not available. Despite the dramatic increase in the number of families living in small urban apartments, no adequate solution has yet been found for storing activity playsets. The existing solutions, such as fabric, cardboard or folding plastic playsets, are structurally weak and do not provide an experience comparable to the outdoor playground. In addition, the assembling and folding of these toys is often complicated and takes too long, causing parents and children to abandon them in the closet. POPIN's game playsets were created specifically to give children the playground experience within the home, while providing an optimal solution to the storage problem typical of small urban apartments. All this, with high safety and at an affordable price. 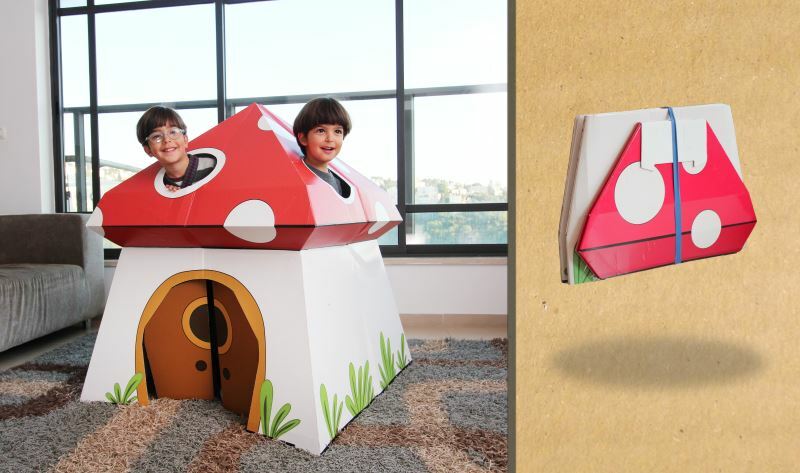 POPIN MUSHROOM PLAYHOUSE - A pivotal part of growing up is the development of self-control over kids' actions. 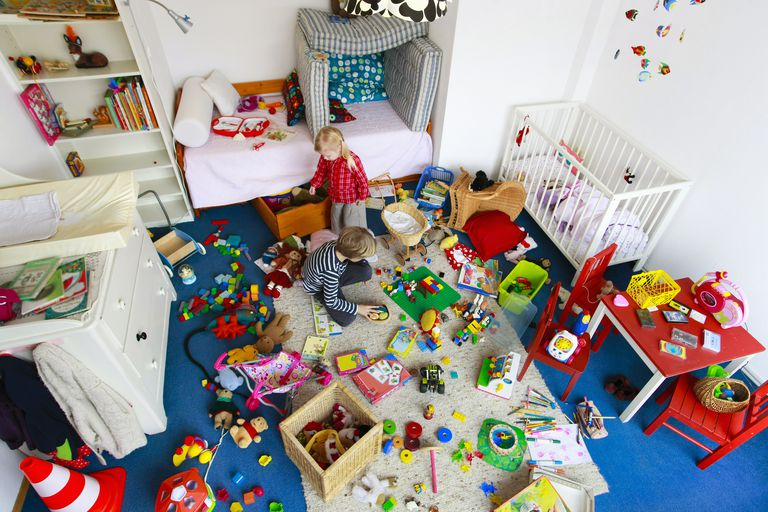 By building a house inside the home, the child can create an area for himself where he is in charge. This autonomy enables the child to strengthen his self-worth, in a constructive and fun manner. POPIN PLAY KITCHEN- The kitchen demonstrates the primary need in nutrition and caring, allowing kids to role-play their grown-up counterparts. In addition, it allows them to develop their symbolic play skills and creativity, in every situation they can dream of. 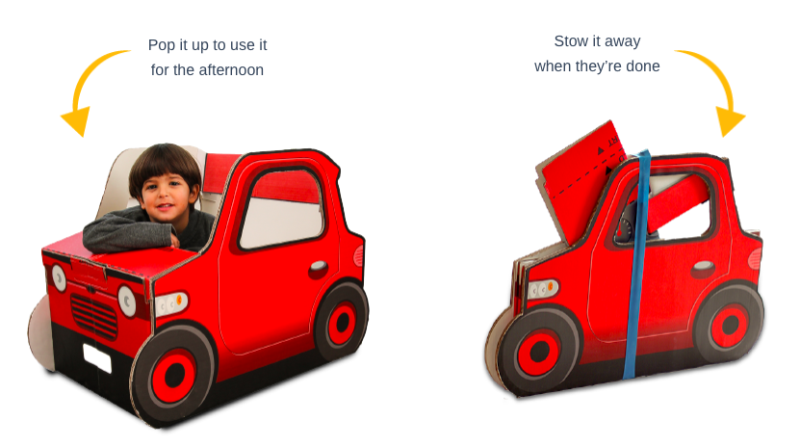 The main advantage of POPIN's products, apart from being enjoyable and providing hours of active play for children, is their ease of use: in just 5 seconds, the product can be folded into a flat package less than 5 cm thick that can be easily stored anywhere in the house. Constructed from eco-friendly aterials - all play playsets are made of recycled cardboard and can be fully recycled. Patent Protected (each facility is protected by a separate patent). Approved by the Standards Institute of Israel (SII) and the European standard for toy safety: EN 71-73. The products are also in the process of passing the ASTM F963 standard of the American Standards Institute. 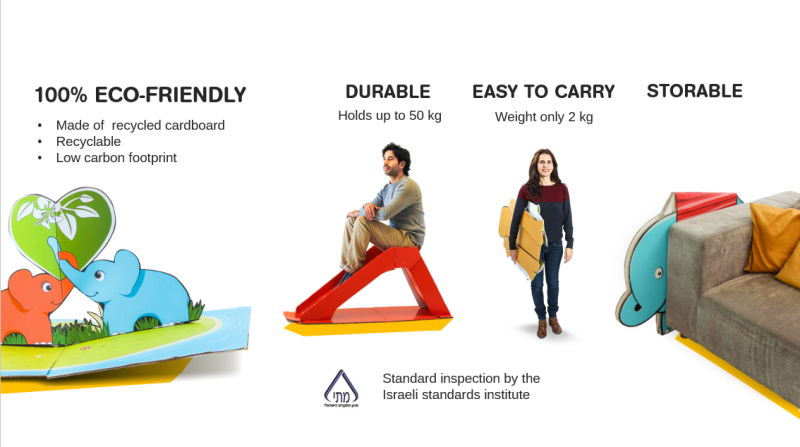 How can lightweight cardboard structures support high loads and also fold in 5 seconds? Creates structural strength and rigidity when unfolded. In the first planning stage, the playset is constructed from cardboard by simplifying its shape into flat surfaces. The fold lines between the surfaces provide rigid structural geometry, which gives physical strength to the playset. In the second planning stage, mathematical tools from the origami world are used to calculate the length and angles required to fold the toy into one flat unit. The final production is carried out in standard cardboard plants using machines capable of producing thousands of units per day, from folding the cardboard to full assembly. 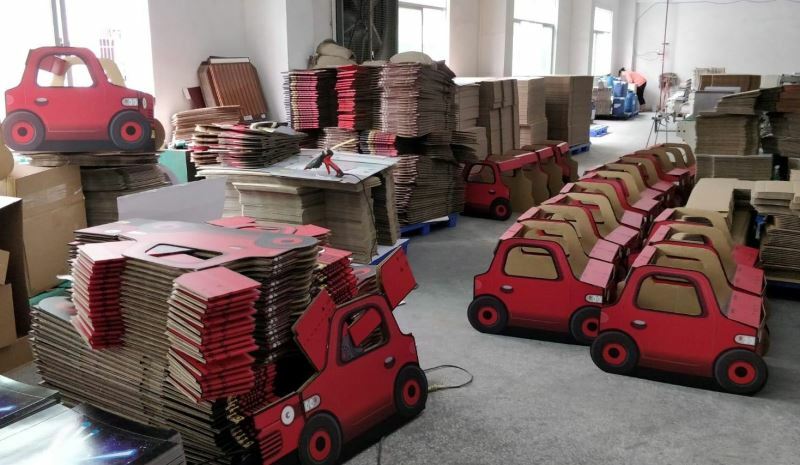 The shipping and storage advantages of POPIN's folded playsets allow for high margins from selling directly to customers on online platforms. Many times, purchasing a great and fun playset for a child requires going especially to the store. If the customer wants to purchase the playset on an online platform, the shipping costs significantly increase the price. 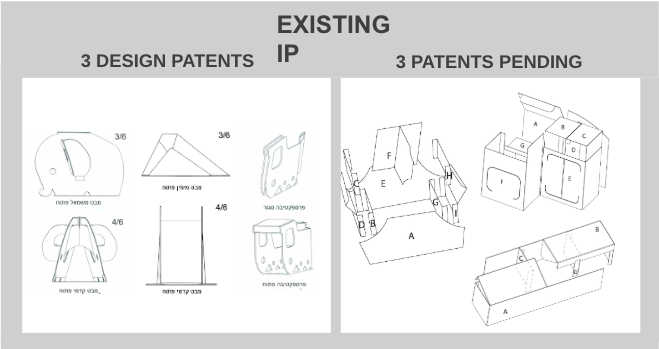 Patents – Each of the playsets is protected separately by a registered patent. Sub-structures and geometrical locks are also protected by a patent. Automation of the production process will reduce costs and enable the transfer of production to the vicinity of the target markets. Ori graduated the Department of Industrial Design at Bezalel Academy of Art and Design. Specializes in a unique design niche of folding products, designed dozens of products from various materials for numerous customers, and his designs have been recognized and awarded. Uri is an enthusiastic activist in the field of sustainable design and has also established a library of green raw materials at Bezalel. Today he works as a lecturer and a consultant in the field of cardboard products. Inspired by pop-up books and great love for toys, Ori founded POPIN toys, with the purpose of making products from green materials and supplies, and bringing real solutions for parents in the modern world. An experienced entrepreneur with 5 years of proven marketing and sales experience in the toy market. Niv brings with him a unique combination of strategic thinking with a talent for meticulous, energetic, creative and motivated work, extensive work experience (B2B, B2C) both in large organizations and in start-ups. Niv founded a start-up company that developed mobile games for children and was responsible for all stages of marketing and sales of the company‘s physical products, both in building strategy and methodology and up to implementation and execution of the programs. He negotiated with large toy distributors around the world, including retail stores such as Wal-Mart, Toys R Us, Hamleys and Harrods. His efforts brought nearly $ 5 million in global sales. Niv holds a BA in Cinema and Television from Tel Aviv University. -	29 years of experience in senior positions and as an investor: -	11 years in development, marketing and sales in leading companies such as Fibronics and MRV Communications, where he co- initiated a new division that reached annual sales of over $ 100m. Last position VP Strategic Sales, with direct annual sales of $ 20m worldwide. -	18 years of experience in the field of active investments in start-up companies as a private investor, as a senior investment manager in the Apax Partners venture capital fund and as VP of investments in Xenia incubator. -	Director and private investor in a number of companies, with proven success from the establishment to sales and exits. Among the companies: • Galatea, which was sold to the Israeli company Sarin with more than 7X ROI • Evature, which was sold to Booking.com with an impressive 14X ROI Yechiel’s education includes degrees in the fields of technology and business: •	BScEE with honors from the Technion. •	International Executive MBA from Northwestern University and Tel Aviv University. •	PhD Candidate in Business Administration, International School of Management, Paris. Dear Investors, We are happy to share that POPIN will be presented in "The Saving Show" hosted by Menahem Horovitz, Today at 19:45 in channel 12 (Keshet), In addition, we have an official date אם our Kickstarter launch! 10th of April 2019 , you are welcome to follow all updates regarding the launch via our facebook page - https://www.facebook.com/pg/popintoys/ Thanks! POPIN successfully filed a new patent application to the U.S. Patent and Trademark Office (USPTO) on the company’s new play structures. The patent protects POPIN from infringement of the geometric locks of the structures that allow instant folding from one hand and durability and stability from the other.